In part 1 of this series, we established that thermoplastics present many benefits across a range of industry areas because they are dielectric, exhibit low thermal conductivity, provide better flow rates, and are made to last longer than metal, even when in contact with corrosive liquids. Also, unlike their metal counterparts, they are pure, so they do not contaminate the fluids they transport. 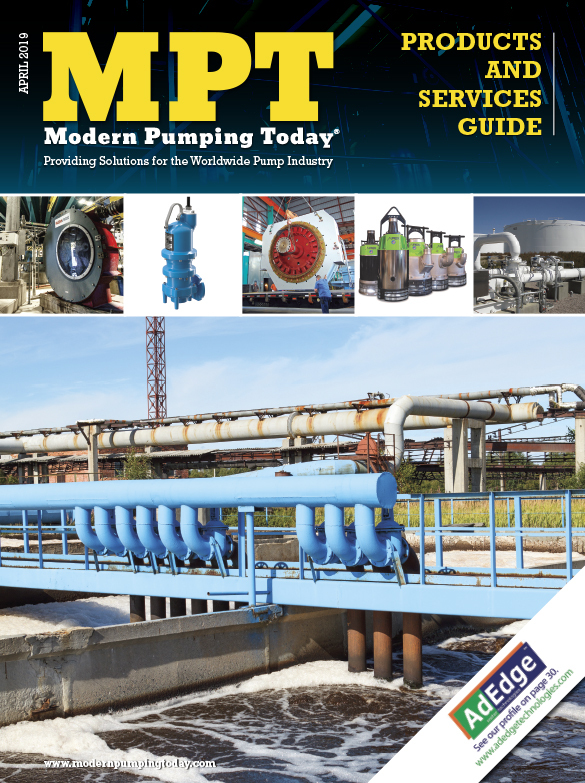 In this month’s conclusion, we’ll examine some of the specific plastic materials used in valve and piping systems. Each material has its own unique properties, so understanding them is vital to a successful design, installation, and operation of a system. PVC has excellent chemical resistance, strength, and rigidity. It resists attack by most acids and strong alkalies, as well as gasoline, kerosene, aliphatic alcohols and hydrocarbons, and salt solutions. Aromatic, chlorinated organic compounds, and lacquer solvents do affect PVC chemical properties. Its low cost and overall balance of properties make PVC material best suited to the widest number of corrosive applications. Its temperature limit is 140 degrees Fahrenheit (60 degrees Celsius). The properties of CPVC and its advantages are very similar to those of PVC; however, its working temperature range is higher (195 degrees Fahrenheit [90 degrees Celsius]) than that of PVC. It should be specified, in some instances, where hot corrosive liquids are being handled, an extra margin of safety is required. PE is produced from the polymerization of ethylene. Depending on the polymerization process, PE piping systems are available in low and high-density versions. These forms of PE are distinguished by specific gravity. Low-density PE (LDPE) generally has a specific gravity of 0.910 to 0.925 g/cc. High-density PE (HDPE), on the other hand, usually has a specific gravity of 0.941 to 0.959 g/cc. The different grades of PE have different mechanical properties. Where HDPE is generally superior to LDPE, it is important to know which mechanical properties you are reviewing when selecting PE for your application. Polyethylene can be used in low temperatures (32 degrees or colder) without risk of brittle failure. Thus, a major application for certain PE piping formulations is for low temperature heat transfer applications such as radiant floor heating, snow melting, ice rinks, geothermal ground source heat pump piping, and compressed air distribution. These properties also make PE ideal for many single and double wall water reclaim systems. A member of the polyolefin family, PP is one of the lightest plastics known. It possesses excellent chemical resistance to many acids, alkalis, and organic solvents. PP is one of the best materials to use for systems exposed to varying pH levels, as many plastics do not handle both acids and bases as well. It is not recommended for use with hydrocarbons and aromatics. Its upper temperature limit is 195 degrees Fahrenheit (90 degrees Celsius). This high molecular weight fluorocarbon has superior abrasion resistance, dielectric properties, and mechanical strength. These characteristics are maintained over a temperature range of 32 degrees Fahrenheit (0 degrees Celsius) to 250 degrees Fahrenheit (121 degrees Celsius), with a limited usage range extended to 302 degrees Fahrenheit (178 degrees Celsius). 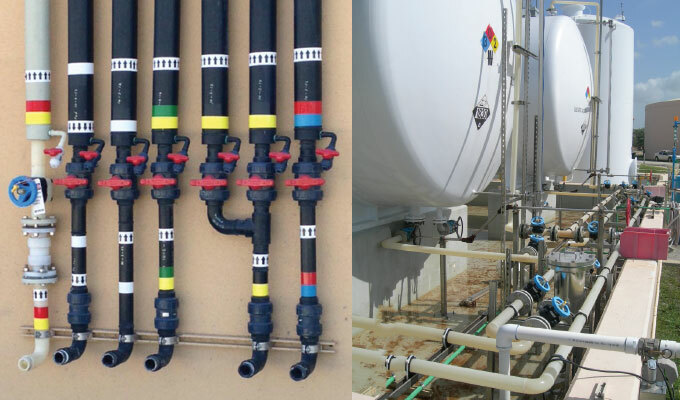 In piping systems, PVDF is best suited for systems operating from 0 degrees Fahrenheit (-17.8 degrees Celsius) to 250 degrees Fahrenheit (121 degrees Celsius). PVDF is highly resistant to wet or dry chlorine, bromine and other halogens, most strong acids, aliphatics, aromatics, alcohols, and chlorinated solvents. Because of its extremely low amounts of extractables, PVDF is widely used in the transport of ultra-pure water for the semiconductor and pharmaceutical industries. 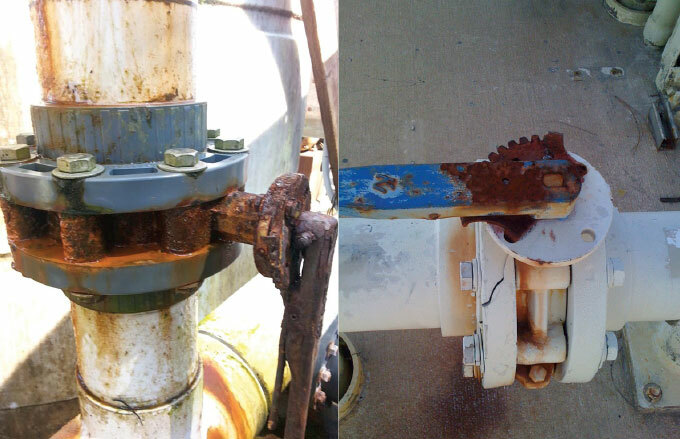 Rust is a common problem facing metal valves that thermoplastics care able to sidestep. ECTFE fluoropolymer is commonly known by its trade name Halar®. ECTFE is essentially a 1:1 alternating copolymer of ethylene and CTFE (chlorotrifluoroethylene). 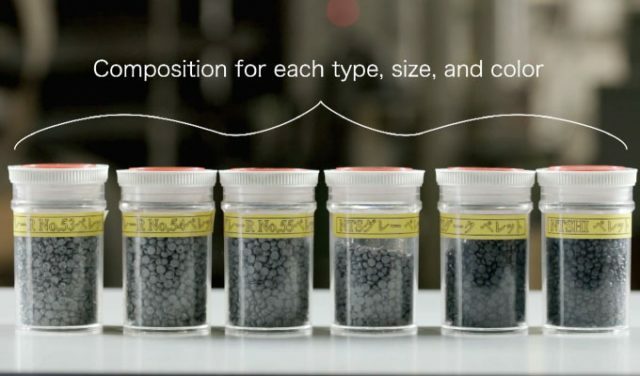 It contains about 80 percent CTFE, one of the most chemically resistant building blocks that can be used to make a polymer. However, CTFE homopolymers are difficult to fabricate, extrude, or mold. By the copolymerization with ethylene, ECTFE displays much of the chemical resistance of CTFE with the case of processing. It provides excellent chemical resistance-handling applications that almost all other materials cannot. In particular, ECTFE demonstrates effective handling of fuming acids and chlorinated bases. It is most likely the best material for handling high concentrations of sodium hypochlorite. Additionally, ECTFE has good electrical properties, and a broad-use temperature range from cryogenic to 300 degrees Fahrenheit (150 degrees Celsius). ECTFE is a tough material with excellent impact strength over its broad-use temperature range. ECTFE also maintains useful properties on exposure to cobalt 60 radiation at dosages of 200 megarands. It is one of the best fluoropolymers for abrasion resistance. Offers increased temperature resistance. PP-RCT is an advancement in polypropylene polymers and has a wide range of benefits for commercial plumbing systems. It has a more complex crystalline structure that provides greater pressure capabilities at higher temperatures than conventional PP materials. When utilized in a piping system, these enhanced mechanical properties make it suitable for higher temperature applications such as boiler and hot water systems. They also create lighter and thinner piping while maintaining the necessary system pressure ratings. PP-RCT can also be extruded in a multilayer pipe with fiber core middle layer. This core reduces the impact of thermal expansion on the piping system. When utilized in a piping system, plastics create lighter and thinner piping while maintaining the necessary system pressure ratings. Having corrosion problems with metal valves or pipe? Plastics is your answer. Plastics won’t corrode. Plastics won’t rust. 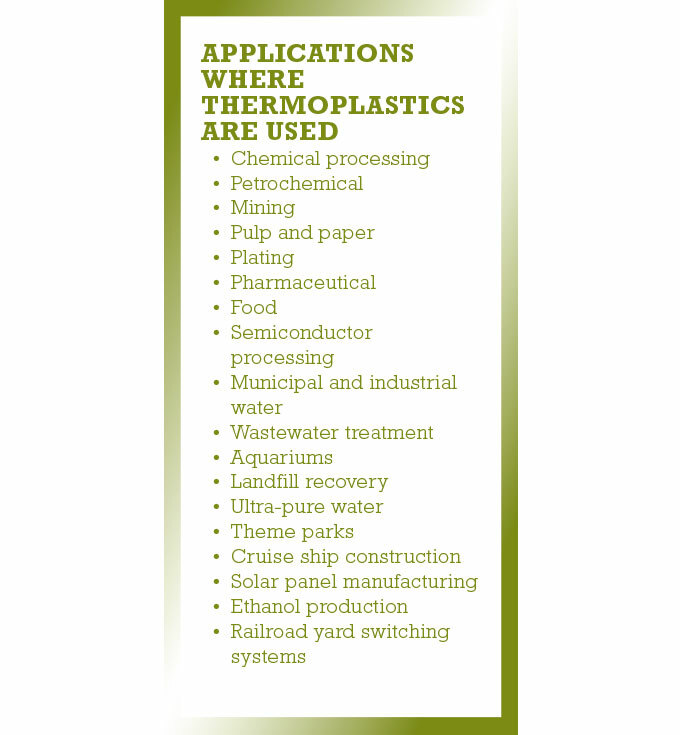 Plastics are application tested across numerous industries transporting even the harshest chemicals. Performing within the proper temperature and pressure, thermoplastics valves and piping can provide a rust-free, corrosion-resistant, cost-effective alternative to their metal counterparts. Jeffrey Baker is marketing and catalog sales manager for Asahi/America Inc. in Lawrence, Massachusetts. Baker has over fifteen years’ experience promoting the benefits of thermoplastics as an alternative to metal for fluid flow applications and can be reached at jbaker@asahi-america.com. 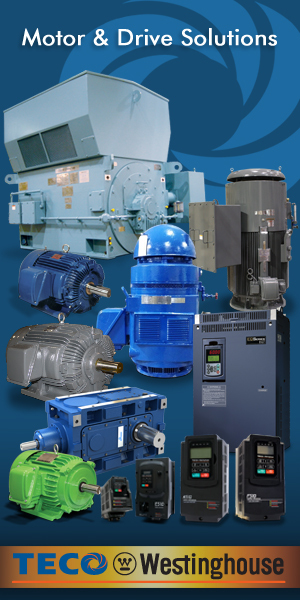 For more information, visit www.asahi-america.com.